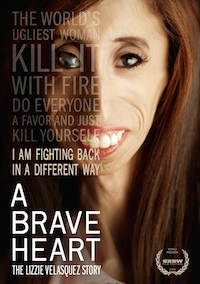 Since premiering at SXSW this spring, Lizzie Velasquez and her film, A Brave Heart, have hit the ground running! Cinema Touching Disability is delighted that Lizzie took a few moments from the non-stop demands of promoting her film to answer some of our questions about her work and life. What made you flip the switch from being a victim of bullying to an advocate against it? Did you make a conscious decision or was it more of an automatic response? I think over the years of trying to figure out who I am as a person I became an advocate against being a victim of bullying without realizing it. There is a saying that says you can’t love anyone else until you’re able to love yourself from the inside out. That saying applies so much to becoming an advocate for others. I had to figure out how I was going to handle being bullied personally and over time was then able to become an advocate for so many others. Regarding bullying when you were younger, is there any advice you wish someone had given to you? Looking back to when I was younger I’m confident in the fact that i had such a wonderful support system who always gave me the best advice. When you’re a kid though you really believe you know everything in the world. I was listening to the advice everyone was giving me but I wasn’t really hearing it. What is the most important lesson the audience at the Cinema Touching Disability Film Festival can learn from your film? Don’t ever let your physical condition become your definition of who you are as a person. You are so much more than that whether you’re able to believe that right now or not. No matter what disability you have, you have the power of any superhero in the world. Be brave enough and have the courage to set your goals really high. Be ready to work as hard as you can. No matter where you end up, you will feel like a million bucks because along that journey you will pick some super powers you never knew you had. Are you ever nervous or afraid when preparing to speak or talk with an authority, in a school or legislature, about bullying? How do you deal with your fear? Talk about the positive changes you have seen as a result of your advocacy. I receive countless messages and comments from people around the world of all ages who will share their story with me. It often starts with a message from someone who was really hurting. After hearing my story they are able to go back and share with me how it impacted their lives for the better. I can feeling them smiling while reading their words on the computer. That alone is like hitting the jackpot for me. Did you learn anything new about yourself as a result of making a film? The biggest lesson I learned while making the film was that it’s okay to admit that I’m having a bad day or to cry on camera. For so long I’ve never shown that side of me because I thought people would see me as weak. Realizing that it’s more than okay to share when you’re struggling is one of the biggest lessons I’ve ever learned. What are some your personal favorite films? I will admit my top 3 favorite movies of all time are really depressing! I just love each of them so much for so many different reasons. The first is Steel Magnolias. I have a life long dream of meeting Julia Roberts one day and this film is where my admiration for her began. Terms of Endearment and Beaches are my two other favorites. What are some of the ways you balance your schedule (which seems to be ever more demanding!) with taking care of yourself? What are some of your favorite ways to relax? Catch A Brave Heart, with an exclusive video intro from Lizzie herself, at Cinema Touching Disability, November 7!